I love peonies. They are deer proof which is a HUGE plus as we have deer constantly walking thru our yard year round. I love their fragrant flowers. With all the varieties of peonies I have, there are many colors, shapes and sizes of flowers in our yard. 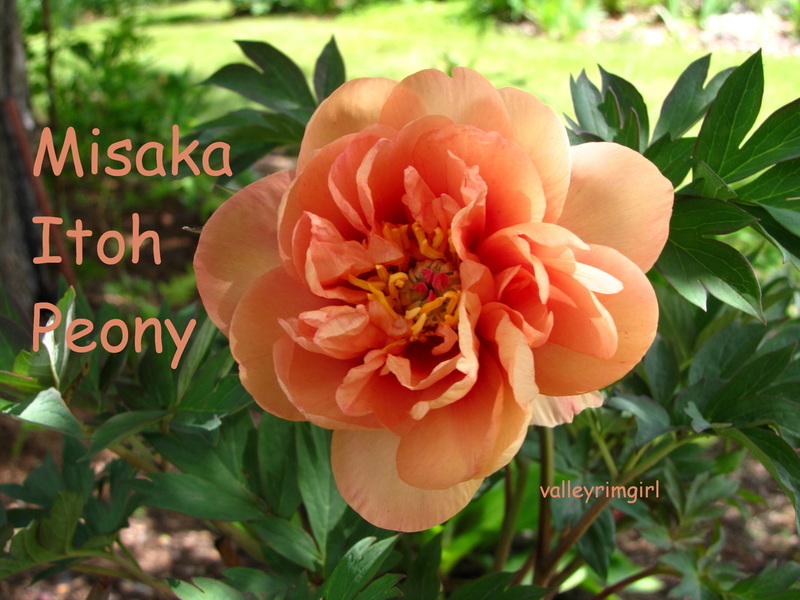 Itoh peonies are special to me. They are a cross between the tree peony and the herbaceous peony. They have large flowers, sturdy stems, die back to the ground each winter, come in wonderful color combinations and are totally hardy to my zone 2b garden. (Don Smith '11) Released by Monrovia. Misaka means Beautiful Blossom in Japanese. When first opening, the up to 8" flower will be orange, just as my picture. 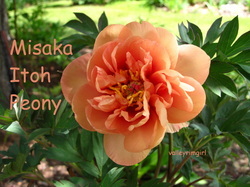 This color is rare among Itoh peonies. The flower will fade to a beautiful peachy-yellow in full sun. Once fully open, flowers are yellow flushed with pink with a mild pleasant fragrance. Large contrasting dark-red central flares are extremely prominent. Misaka has a higher than average number of secondary buds. Height and width - 20" - 30"